Does capitalism have to be bad for the environment? Capitalism leads to the destruction of our natural environment. Or does it? Ecologists and environmental scientists often take “overpopulation” and the subsequent exploitation of natural resources as the point of departure in their prognoses of environmental crises. While refusing to look beyond what seems to be the roots of the malaise, they argue that overpopulation compounded with unbridled industrial activity leads to environmental disasters such as global warming, climate change, acid deposition, soil degradation, air and water pollution. There is no denying that overpopulation, and indeed, the massive industrial outputs of both developed and developing countries, do have irrevocably deleterious impact on the climate. But what is often omitted in their diagnoses is the environmental hazards inherent to the dynamics of capitalism as a universal economic system. Capitalism - defined as production for profit for a competitive market - is an economic system in which the private profit-maximization motif lies at the core of its virtues and maladies. Its virtues are embedded in its impressive productivity and growth rates. The profit-maximization logic induces the producers to specialize in what they are best at producing and invest in the latest technologies to increase productivity and efficiency. The profit-maximization motif also provides incentives for entrepreneurs to increase productivity on a large scale to optimize profit. The same profit-maximization motif, too, enables economic agents to allocate resources in such ways that are conducive to growth and dynamism. Compelled by the competitive force of the market, firms find it rational to invest in cost-cutting technologies, which allow them to resist the pressure that comes for their peers in the marketplace. This altogether leads to a virtuous cycle of efficiency, productivity, and optimized profit. Examples of success in terms of growth rates are numerous in the modern history of capitalism. The massive industrial development of England in the 18th and 19th centuries, the United States as early capitalist developers prior to the two devastating World Wars, the remarkable growth of rates western Europe (i.e. Germany, France, Italy,) in the post-war era followed by Japan in the last half a century, the rise of the East Asian Tigers and, of course more recently, the Chinese leviathan are the conspicuous examples of stunning economic development in contemporary capitalism. So what is the problem? After all, if capitalism has been very successful in projecting itself as the engine of productivity and growth, why should it be blamed for environmental disasters? It is herein that the very core dynamics of capitalism that generate its virtues, also cause its maladies. Capitalism requires endless growth of production in order to remain stable, raise the standards of living, and produce ample employment for the young and increasing world population. Production itself is contingent on consumption. Without sufficient consumption, which creates more demands for production, the production cycle would be paralyzed. Consumption is thus the flip side of the coin of a thriving production cycle. But while capitalism stimulates tremendous productivity rates, it biases productivity towards more consumption to ensure that the production process is not impeded. Therefore, mass consumption - or consumerism - is not merely a cultural phenomenon. It is embedded in the core tenets of capitalism as an economic system. The higher consumption, the higher production, the higher production, the higher sales, and with higher sales, higher profits are generated, which are largely re-invested in the sustainability of the firm or the business-unit. But if we live in a finite planet with limited ecological and natural resources that ought to be preserved for sustainability purposes, how than, can we resolve this contradiction? If the carrying capacity of the world cannot sustain endless consumption and production, there is clearly a contradiction at stake here. This contradiction naturally raises the more important question: how to reconcile the quandary of maintaining a capitalist system that meets necessary growth rates to remain stable on the one hand, and simultaneously contain the environmental hazards that threaten our planet on the other? To answer these questions, there are three propositions about the very nature and dynamics of capitalism that have to be examined. First, firms in a capitalist setting are under enormous pressure to cut costs, because if they don’t, their competitors will. Since their competitors cut costs to be able to reinvest in the firm’s growth and thereby, become more competitive, if one firm refrains from doing so, it will be soon pushed out of the market by others. As the economic sociologist Erik Wright of the University of Wisconsin-Madison said, one way of cutting cost is to project some of that cost onto the environment. Imagine, for instance, throwing a can of soft drink from a car window because this is a low-cost way of disposing of a can, and being totally indifferent to its negative impact on others. The same behaviour is often adopted by large businesses. The market dynamics in capitalism do not provide any mechanisms in themselves to prevent this behaviour; it requires some forms of non-market intervention either by state or by organized social forces. States have shown that they are reluctant to or deliberately ignore taking measures against this. In democratic countries, however, social forces are given relative freedom to organize around this cause. Social activists with a whole slew of interests - including the environment - usually take it upon themselves to draw public attention to this issue. Through mass organization, environmentalists can pressure the state to impose certain regulations on firms to conduct activities that are less detrimental to the environment. Secondly, the price of non-renewable natural resources under capitalism is usually organized around relatively short-term horizons with almost no account of the future value of these finite resources. The rate of greenhouse gas emissions into the atmosphere has increased sharply since the mid-1990s, driven mainly by strong economic growth in developing countries that often consume massive natural resources such as oil, gas, and other minerals. China and India have grown rapidly in the past two decades and the bedrock of development in their industrial settings are non-renewable natural resources, which happen to generate one of the highest rates of carbon gas emissions. Non-renewable natural resources are often underpriced since their future value is not accounted for in the dynamics of supply and demand. In an influential study for the World Bank, Margaret Slade shows in great detail that the enormous negative “externality” - negative impact - that’s inflicted onto the environment as a result of extraction, production, and the use of minerals is largely due to underpricing those natural resources. Which is to say, the massive minerals consumption that’s responsible for a large fraction of world pollution are not taken into account in the prices that they are offered in the market. The upshot is that buyers tend to overconsume these resources. The fluctuating price of oil that’s produced by the Persian Gulf States is the most telling example. As I alluded earlier, the architecture of market under a capitalist setting does not provide any mechanisms to counter the environmental hazards that the large-scale production and consumption processes inflict on the environment. Hence, there have to be non-market interventions to contain or reduce environmental damages. This non-market intervention can be either state or social forces. Of course, one could argue that it is state’s responsibility to regulate this inimical behaviour of the firms against the environment by heavily taxing those firms that violate the environmental regulations that the state sets in place. But the problem is that states in democratic and non-democratic countries alike often overlook this, or deliberately neglect it due to the pressure that comes from the influential business groups. In most countries, the state is subservient to the bindings of the influential business groups. The state needs to provide incentives for business groups to ensure that they remain as dynamic as possible to ensure economic growth and ample employment opportunities. So the state on its own would be reluctant to take measures that might reduce the profit rates of business-groups for the sake of the environment. Take for instance the Chinese or the Indian states who are totally oblivious to the environmental disasters around the industrial settings in those countries. Hence, obliging the states to intervene is going to be a challenge. Individual firms, too, do not have an incentive to oversee regulations that protect the environment because they are compelled to maximize profit under the tremendous pressure of market competition. There remains another form of non-market intervention, which is social forces. In democratic states people enjoy a certain level of freedom for social activism. Thus, in democratic states, environmental activists can form disruptive movements that seriously demand far more stringent regulations to save the environment. In some cases, they may be able to compel the state to impose restrictions on the firms and inspect them regularly. This seems to be a viable option, but the responsibility to organize around the cause will be endured by the activists to organize massive public demonstrations to pressure the state and the firms. International cooperation is also key for effective abatement. But achieving meaningful international cooperation has proven to be a hard task. 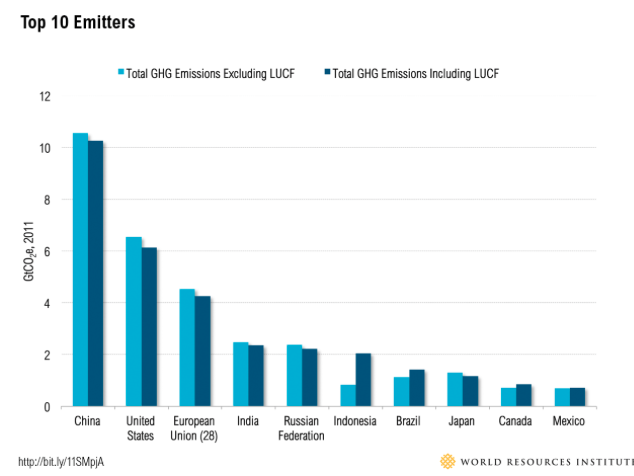 Even though nations have a common interest in preventing climate change, many are reluctant to reduce carbon emissions voluntarily. The recent Paris Agreement on Climate Change, in which 195 countries adopted the first-ever universal, legally binding global climate deal, is indeed a very positive move towards international cooperation to protect the planet. In short, the market mechanisms under capitalism do not provide incentives for preserving the environment. Firms are constantly threatened by market competition to cut costs and optimize profit. The environment thus falls pray to the compulsive market behaviour of the capitalist mode of production. Without the intervention of non-market entities such as the state, international organizations and social forces, capitalism as an economic system simply will not safeguard our planet.